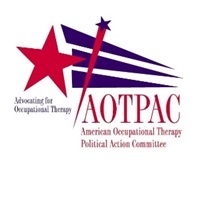 The American Occupational Therapy Political Action Committee (AOTPAC) is a voluntary, nonprofit, nonpartisan, unincorporated committee of members of AOTA. The purpose of AOTPAC is to influence or the selection, nomination, election, or appointment of any individual to any Federal public office, and of any occupational therapist, occupational therapy assistant, or occupational therapy student member of AOTA seeking election to public office at the city, state or federal levels. AOTPAC seeks to promote the legislative aims of AOTA. "The Model of Human Occupation (MOHO) explains how occupations are motivated, patterned, and performed within everyday environments (Kielhofner, 2008). It has been argued that MOHO is the most widely-cited and utilized occupation-focused practice model in the world (Haglund, Ekbladh, Thorell, & Hallberg, 2000; Law & McColl, 1989; Lee, 2010; National Board for Certification in Occupational Therapy, 2004).